The blade is 0.165" constructed of 154CM steel and hand ground with a wicked curved clip point. There is 1.915" extending from the handle in the open position. The over all length of the blade is 2.605 including the tang and it uses Nylatron 0.015" bushing between the blade and frame/scale. The frame is constructed of light weight and durable 6Al-4v Ti, which is mated to a G-10 scale using heat treated 416 pins that are made specifically for this knife. Both the frame and the scale are 0.165". The over all width of the knife is 0.530", with the over all length being 3.080" in the closed position and 5.015" in the open position. 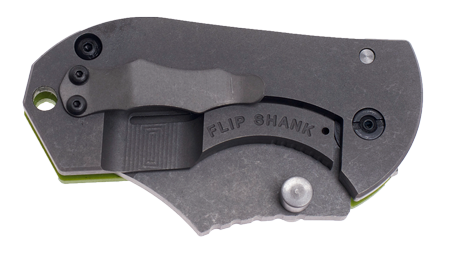 The pocket clip is titanium and is set so that the knife carries securely in the pocket with the tip up. The titanium frame and 154CM blade are media blasted and then tumbled to smooth the edges and impart an attractive and low maintenance finish. This knife is built for hard use in a compact, no nonsense package. It has been designed to function flawlessly in extreme environments such as off shore oil rigs (resistant to hydrocarbons and corrosion), steel plants (high temperature and abrasive dust resistance), combat zones (shock, dust, and slip resistant) and the wilderness (brightly colored and excellent edge retention). The CFS, introduced in 2014, is ARS Knives' newest folder in thier lineup of hard use folding knives. The CFS is a full sized, incredibly strong, folding knife that will hold up to daily carry, and use, in the most challenging of environments. The aggressive checkering pattern on the G-10 scale increases the surface area of the knife which prevents it slipping from the hand during use. Both the frame and scale are resistant to petrochemicals, corrosive and oxidizing agents, and are resistant to the effects of moisture and temperature extremes. The 154CM blade is highly resistant to staining and corrosion from salt water, blood, and moisture, as well as having excellent edge retention and the ability to be easily sharpened in the field using commonly available tools. The CFS is 8.6875" open and has a blade that is 3.795" long. The closed length is 4.865" which rides securely, tip-up, with the titanium pocket clip keeping the knife's profile low in the pocket. The dual thumbstuds act as a secondary stop point for the blade when it opens, in addition to offering an ambidexterious opening option. The backstop pin and spacers are custom made out of heat-treated 416 stainless steel. A low maintenece and durable media-blasted and tumbled finish comes standard on the knife. ARS Utility Folder is available "By Request Only"
Update! A.R.S. Utility Folder now available in solid scales with out bolsters. 3D contouring makes for a nice custom fit and finish. Available materials: Carbon fiber ,G-10, Canvas or Linen micarta.